Samsung isn't the first company to be stung when it has copied too closely. Many companies follow the lead that someone else set, because that is where consumer attention is focused. Like others before them, they believed that adding a few small details will be enough to protect them. Unfortunately for Samsung, it is big enough to know better and should have been better prepared, since Apple has a huge reputation for litigation. Apple's own website has a huge list of trademarks that it owns. The only thing missing is a clear statement that Apple will attack you to the full extent of the law if you put a single toe across the line. 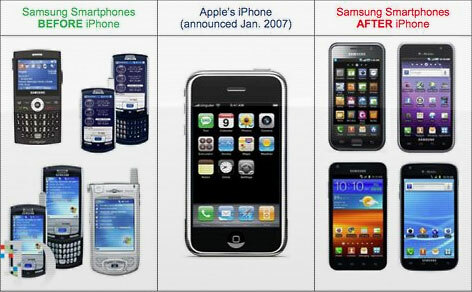 Apple's image showing how the iPhone influenced Samsung smartphone design. Apple and Samsung may have had a good vendor/customer relationship with Apple buying Samsung components. As Samsung started moving its product design to match Apple, let's just say friendship ends when money is on the line. It was obvious from day one that an Android tablet would compete directly with the iPad, and there is no pretending that Apple would ignore it. Many people have been making hay out of the injunction on Samsung's Galaxy tablet in Europe. These people are blinded by the popularity of the iPad design as being the only option (see iPad Trade Dress Ruling in Europe Won't End Tablet Competition). They are underreporting the importance of the look of a product for the name brand company. We all see trademarks everyday and understand them a little. We have Tylenol for headaches, Ford for cars, and Google for web search. Beyond trademarks, anything about a product can make it distinctive and recognizable. Thinks of the Golden Arches used by McDonald's, the shape of a Coca-Cola bottle, or the blue diamond shape of a Viagra pill. These distinctive visual clues are protected by trade dress laws, which are part of the overall trademark laws. We now know that those crazy Europeans allowed Apple to create a trade dress over the look of the iPad but think we'd be too smart for that here in the US. Wrong, we have similar laws here, and the Supreme Court has this to say about trade dress: "almost anything at all that is capable of carrying meaning" as a "symbol" or "device", terms used to define trademarks in The Lanham Act. The US gives the same kinds of protection as Europe, and the battle with Samsung could impact imports here just as easily. Are these are just frivolous lawsuits by Apple to unfairly block Samsung from the market? Not hardly! We can look at a similar case between two other companies to see what is at stake. In the case of McNeil vs. Granutec, Granutec was selling a capsule that looked a lot like Tylenol. Tylenol was a red and yellow, and so was Granutec's generic equivalent. McNeil thought they were too similar, after all with all the possible color choices(e.g., red/green, blue/yellow, red/white, etc.) there was no reason to use red/yellow except to match Tylenol. In the OTC drug market, brand loyalty is not a small matter, and OTC drugs are not small business. In the gelcap's first full year on the market, McNeil spent forty million dollars on consumer advertising - primarily in an effort to regain the loyalty the Tylenol brand lost when its capsules were tampered with. McNeil's Prop. findings of Fact and Concl. of Law at 13. The red and [*204] yellow capsule-shaped gelcap thereafter became McNeil's top selling Tylenol product. Because of the history behind the Tylenol gelcap, e.g., the tampering incidents with the capsule and the subsequent marketing blitz for the gelcap, Granutec's copying of the gelcap's shape, texture, and color combination is particularly troublesome to McNeil. McNeil has taken great pains in the last seven years to regain public confidence in the Tylenol name, and the Tylenol gelcap appears to have obtained strong name brand recognition and quite a large following. To permit Granutec to indistinguishably copy McNeil's red and yellow gelcap not only allows Granutec to benefit from Tylenol's name brand recognition and faithful following, but also takes [**15] away McNeil's control over its reputation and goodwill. There can be no doubt that Apple spends just as much on advertising the iPad as McNeil did for Tylenol. And if Samsung's tablet is too similar to the iPad, then brand recognition and faithful following is not something they should be allowed to take away from Apple. There are millions of possible changes that Samsung could have made - different color, edge details, contours, raised surfaces, buttons, bezels, etc. A more thought out design could have distinguished Samsung's product from the iPad. Apple is not to blame in this situation. Samsung can easily fix the problem with a few changes. It will cost time and money, but they will soon be back on the market. While some may think its not possible, Samsung could even come up with a better design that gets Apple imitating it. Sure, this isn't likely given their copycat attitude, but it is possible.